Killiney Kopitiam is a traditional Hainanese style cafe chain in Singapore that has created a strong following among local coffee aficionados and the breakfast club. Its original location, situated at 67 Killiney Road, is the country’s oldest existing Hainanese coffee shop dating back to 1919. Since then, Killiney has grown to include over 55 outlets spread all around Singapore, Malaysia, Indonesia, Hong Kong and even Australia. 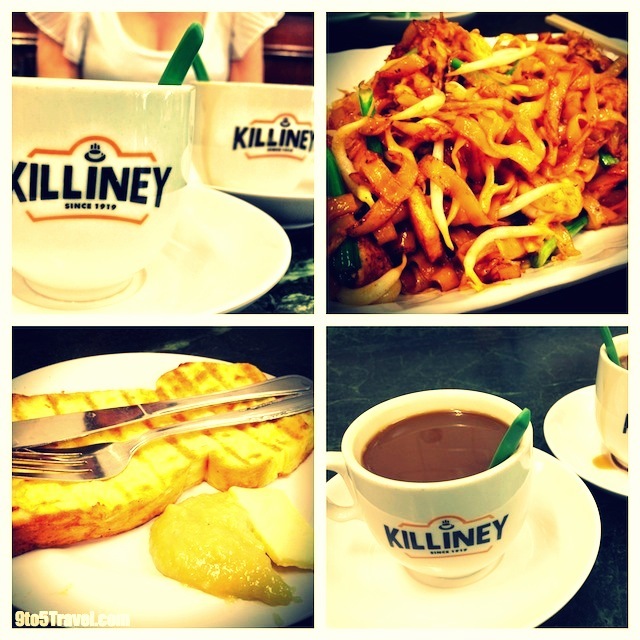 Killiney’s most popular meal includes kaya “bread toast” accompanied by runny eggs and strong, sweet kopi (coffee). The crunchy Killiney toast is charcoal-grilled and topped with kaya (produced fresh daily in the shop) – a rich jam-like spread made from a sugar, egg and coconut concoction with a light green colour from fragrant pandan leaves. Their eggs are served half-boiled in very hot bowls, and you are given the pleasure of cracking the eggs open on your own into a sauce dish. You can choose to dip your toast in the eggs, or have them with some ground pepper and soy sauce, all in the traditional style. Killiney kopi is specially concocted from a blend of Robusta coffee beans from Indonesia and premium Columbian Arabica beans. Their coffee beans are then roasted with a special recipe in authentic Hainanese style, creating an alluring aroma and mesmerizing taste, rich in flavour and body. I ordered a set which includes a choice of toast (I went with the French) + Killiney hot coffee or tea + 2 soft boiled eggs. Killiney French toast is served with a generous dollop of kaya and slab of butter on the side, in lieu of maple syrup. Instead of a toast-combo, Gary opted for some delicious char kway teow, the quintessential Singapore-style fried noodle dish, and it was the best kway teow we had during our whole trip!